The stock market is on sale right now. What are the best buys? Image: Flickr user Ann Marie Michaels. During a crash, it may be tempting to buy volatile stocks whose share prices have plummeted, but that's not necessarily the best move. In fact, the best stocks to buy might be the ones that barely took a hit. This may seem counterintuitive, but when you hear my reasoning, I think you'll agree. The most successful long-term investors know that the secret to creating wealth is not picking stocks that perform well when the market is booming. In fact, the most important thing to your long-term success (or failure) is how well your stocks perform when the market is headed down. Think about the math for a minute. Let's say you own a stock that trades for $100 per share, and it loses 25% of its value during a crash, making it worth $75 per share. To get back to breakeven, your shares need to gain $25, or 33% of their new $75 share price. If that same stock loses 50% of its value, making its share price $50, then it will have to gain 100% to get back to $100. In other words, in order to make up for a big loss, you have to make an even bigger gain. Therefore stocks that tend to lose more in crashes and corrections are left with much more ground to make up. And since stocks generally don't "crash" upward, it can take much longer for volatile stocks to get back to breakeven once the market starts to rise. Berkshire Hathaway CEO Warren Buffett understands the power of crash-resistant stocks, and he uses them to his advantage in Berkshire's portfolio. To illustrate this point, let's look at a three-year period from Berkshire's history -- 2001 to 2003. 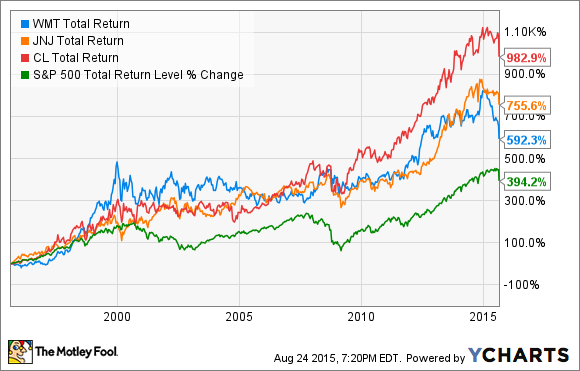 Here is how Berkshire's stock performance compared with that of the S&P in those years. Even though Berkshire significantly underperformed the market in 2002 and 2003, the company's outperformance during the market's decline in 2001 made all the difference in the stock's overall three-year gain. Low beta. A stock's beta is a measurement of how reactive it is to market movements. A stock whose beta is greater than 1 is more reactive than the S&P 500, and a beta of less than 1 indicates a lower volatility. For example, if the S&P 500 drops by 10%, a stock with a beta of 0.6 could be expected to decline by 6%. The three stocks I mentioned above all have betas of less than 1. Solid dividend history. This isn't a requirement, but it helps in a big way. A strong dividend history tends to prop up a stock's value in tough times. As prices fall, dividend yields rise, so income seekers will rush in and support the stock if the price gets too low. All three of the stocks I mentioned are members of the Dividend Aristocrats, a group of stocks that have increased their dividends for more than 25 consecutive years. A diverse revenue stream. This keeps a company from being too vulnerable to weakness in a single business unit. Companies whose revenue comes from only one product, country, and so on tend to be more reactive to certain adverse conditions. For example, companies that sell only oil and gas products have declined much more than the overall market due to slumping oil prices. A "wide moat." This refers to a competitive advantage that can help a company get through the worst market declines. For example, Johnson & Johnson and Colgate-Palmolive both produce many essential products that people need no matter what the economy is doing, and their tremendous brand recognition allows them to command pricing power. Meanwhile, Wal-Mart's size and no-frills approach allow it to sell its merchandise more cheaply than its competitors can, all while remaining profitable. In fact, Wal-Mart's revenue increased during the financial crisis. Now, this isn't an exhaustive list of what makes a stock crash-resistant, nor is every stock that meets these criteria well equipped to handle crashes. The point is to choose stocks with the best chances of doing well during a crash, because these stocks tend to do better over the long run. A lot of investors consider these stocks "boring," but the reality is that all three of the stocks discussed here have handily beaten the market over the past 20 years. By creating a diverse portfolio of crash-resistant stocks, you could be a long-term winner, too.